We were super excited about being back in Thailand and being able to visit that most traditional of cultural establishments, 7-11, which is filled with all our favourite tasty stuff like purple taro bread, 5 baht bags of coffee sweets and weird little pots of mysterious coconutty desserts. However, it still took us about three days to realise that there was one just around the corner from our hotel in Nong Khai. 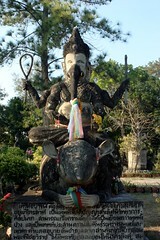 Nong Khai is just over the border, about 20km from Vientiane and a bit further along the river. You can wave at Laos on the other side of the river and watch boats carrying boxes of stuff (Beerlao, we hoped) between the two. 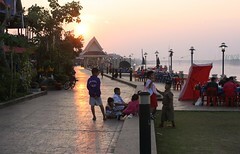 It shares Vientiane's lovely red sunsets, although they're not over the river. It's not a very touristy town and is a little weird, having been relatively recently formed from a number of villages so there's no real town centre. The riverside is developed into an attractive promenade lined with cafes and restaurants, and dotted with pleasant shelters where you can sit peacefully and read a book all afternoon. Further in from the river there are excellent food markets and cheap restaurants - lots of barbecues (including an excellent chicken roasting machine using lots of cogs and bike chains to rotate the chickens). We found ourselves a new pancake lady and learned the Thai word for "four" (we had previously only got as far as three) by ordering two small round sugared pancakes each. She also taught us the word for that kind of pancake so we didn't have to make rounded shapes with our hands any more. Another stall served us the most excellent pad thai. Sadly, Nong Khai is rife with elephant begging - every evening, mahouts drive their elephants into the city and walk them through busy areas, selling sugar cane and bananas so you can have a chance to feed them. One of the things we learned at Elephant Nature Park was that elephants' feet are very sensitive to vibrations in the ground, which they use to communicate and detect danger. Once you understand this, and have learned about the cruel processes use to "break" an elephant to make it obedient, it can be quite upsetting to see these creatures in the city, often babies without their mothers, constantly overstimulated by vibrations from traffic, whimpering and completely subservient. If you're visiting Thailand or anywhere that has elephants, please don't support this practice. Elephants need to eat hundreds of kilograms of food every day and you are not helping it by feeding it a couple of bananas - you are most likely doing it a disservice by making it financially worthwhile to bring it into the city. There are plenty of places where you can hang out with happy elephants, and by supporting those places instead you increase their capacity to help more of the sad ones. We spent several days lounging around in Nong Khai. On our last evening there we took a tuk-tuk out to Sala Keoku, a statue park on the outskirts of the city. Some small, some gigantic, many of the statues can only rightly be described as bizarre or a bit trippy. My personal favourite was a man with an elephant face sitting on a giant rat with hands. In the evening we met up with our friend Matt, who we met in Phnom Penh, and took the lift up to the 64th floor (it's odd seeing numbers that high on a lift counter) of State Tower, the second highest building in Bangkok - there's a bar at the top where they charge 6 quid for a Coke and it doesn't even come in a gold-plated can, but does include spectacular views. Dgym had some vertigo moments but did very well.